I was looking through Taylor’s flickr for raccoon pictures yesterday and rediscovered these shots from summer 2009. There was a heat wave and this mama raccoon came out with her three babies- I guess it was too hot in their den? idk, but the babies were scampering around on my neighbor’s garage roof and the mama was just flaked out on the fence. Remind you of anyone? Like perhaps… FAT STUPID MARVIN??? MARVIN JUST WANTS YOU TO LOVE HIM. 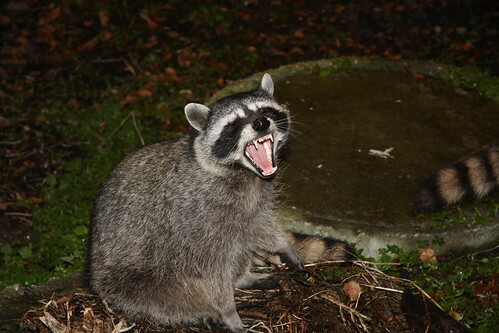 I DO LOVE HIM I JUST DON’T LIKE IT WHEN HE SHOVES HIS FACE IN MY WINDOW idk if you know but raccoons have scary teeth. Oh my. You can tell it’s him by the way he UNABASHEDLY STARES AT THE CAMERA. With cute. Last night I was walking Georgie and the other two ran in front of me and climbed up a tree but Marvin just sat by the sidewalk and STARED, haha. He is so dumb.